This stunning space wallpaper is a false-color image from Japan’s ALOS satellite acquired over part of southern Kenya and the border with Tanzania. Mount Kilimanjaro in Tanzania can be seen in the lower-left corner. This stunning space wallpaper is a false-color image from Japan’s ALOS satellite acquired over part of southern Kenya and the border with Tanzania. Mount Kilimanjaro in Tanzania can be seen in the lower-left corner. 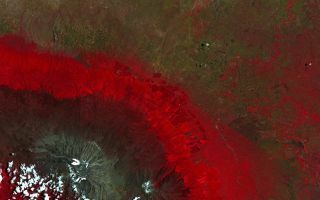 In this image, bright red areas show the rich vegetation of the forested area on the slopes of Kilimanjaro, as well as vegetation of the agricultural areas and along rivers and streams. This image was released Jan. 24, 2014.